This is an easy system for labeling chemicals after migrating to secondary containers. This system includes access to a video presentation that explains the new OSHA requirements. Special Bonus: To help our customers comply with these new regulations, we are offering a Written Hazard Communication Program. When you order our GHS Secondary Labels, you'll receive a follow-up email that includes an editable document that you can use - just fill in your company's name, and simply print it out! This is only available for paid customers who have purchased our GHS Secondary Labels. This label makes it easy to translate the NFPA and/or HMIS language into the GHS label. Simply use the chemical's primary label and mark the blank secondary label accordingly. Features a checkbox for each of the pictograms that represent each hazard. When chemicals are transferred (or 'migrated') from their primary container to a secondary container, then employees are required to properly label the secondary container. Use a fine point sharpie marker to mark the labels with the appropriate safety information. Our labels are a quick and easy way to comply with this OSHA regulation. Q: Do your labels meet current OSHA 1910.1200 hazcom requirements for workplace labeling? A: Our labels, when used according to our instructions, comply with OSHA Hazcom standards for workplace labeling and provide the required hazard warning information. A: Under OSHA Standard 1910.1200, OSHA requires all employers to have a workplace labeling system for secondary chemical containers. Failure to have a workplace labeling system is considered a SERIOUS violation by OSHA. In 2014 OSHA stated that Hazcom is the number two written citation by Compliance Officers. Whenever employees transfer chemicals from a primary container to a secondary container, workplace labels must be placed on the secondary container. OSHA requires all employers to clearly specify their workplace labeling strategy in their written Hazcom safety program by June 1st, 2016. Our label meets these new requirements. Q: What makes your GHS label better than other methods of marking secondary workplace containers, such as HMIS (Hazardous Materials Identification System) or NFPA (National Fire Protection Association System)? A: Our label is easy to use and provides accurate hazard data. Both HMIS and NFPA share the same number rating system to identify health and physical hazards. These systems are currently used by many employers in the US. Workplace labeling under the new GHS standards can be challenging, difficult, confusing and can even be unsafe if workers fill out workplace labels incorrectly. Due to this new global chemical market place, SDS (Safety Data Sheets) coming from other countries don't always provide HMIS/NFPA data since these systems are not globally recognized. Hazards ratings for Health and Physical Hazards under HMIS are on a numbered scale from 4 to 0, with 4 being very hazardous and 0 being the least hazardous. Hazards Categories for Health and Physical Hazards under GHS are noted on the new SDS and these numbers are in a reverse order from HMIS. The GHS scale runs from 1 to 5, with 1 being very hazardous and 5 being the least hazardous. Employees simply take the GHS hazard labeling elements directly from the parent chemical container when migrating chemicals to a secondary container. This reduces confusion and assures that GHS hazard information is accurately transferred to secondary workplace containers labels without the need of HMIS/NFPA ratings. Watch our GHS workplace label training video to see how our workplace labeling system works. Q: Has OSHA and the NFPA recognized their concerns of number rating differences between NPFA/HMIS and the GHS? 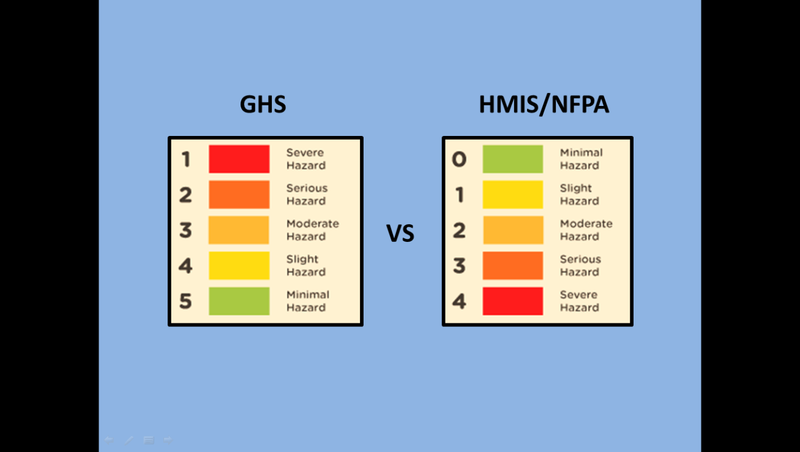 "NFPA believes that the numbered hazard categories resulting from implementation of GHS will cause confusion among traditional users of the NFPA hazard rating and labeling systems. The NFPA 704 hazard rating system has been in effect since the 1950’s and has become a key element of MSDS information over the past 20 years." "Adoption of the NFPA 704 rating and labeling system through building or fire codes throughout the United States means that the recognized symbol and forms are prominently displayed and their posting is an important safety training topic for employers and employees. Additionally, the system is intended to advise the emergency responders in a readily recognizable manner of the immediate hazards associated with a facility." "OSHA recognizes that the approach to numbering hazard categories in the GHS differs from that used in the HMIS and NFPA systems. However, the Agency does not believe that this will result in confusion. GHS category\numbers determine the label elements that would be required for a chemical, but the category numbers themselves would not appear on labels. Where GHS category numbers would appear on the SDS (Section 2–Hazards identification), they would be accompanied by the label elements for the chemical, which would clearly indicate the degree of hazard. OSHA, therefore, does not anticipate that this information will cause employees to become confused. Moreover, the approach taken in the GHS (i.e., assigning higher category numbers to denote less serious hazards) is consistent with the approach used in the DOT transport regulations for many years." We believe that by their statement, OSHA failed to properly recognize the workplace labeling confusion created by the two varying number rating systems. Our label eliminates this confusion and provides a safe and OSHA compliant transfer method of hazard data without a need for the NFPA/HMIS for your workplace labeling system. Q: Can my employees continue to use the old HMIS/NFPA systems with your label? A: We don't recommend continued use of the HMIS/NFPA system for workplace labeling, because there is a potential for confusion with the new GHS hazard category numbers, which we believe can be dangerous. However, employers have the option to continue use of the HMIS/NFPA systems and can do so using our label. Our matching color coded fields on our label can be used to enter HMIS/NFPA or GHS data. Either method can be used during this transitional period as the new standards are implemented and even going forward, should HMIS/NFPA systems remain. We recommend that employees transfer hazard data directly from the GHS parent container label to our secondary workplace label. Employees can enter the Product ID, Signal Word, Pictogram, Hazard and Precautionary warnings and even enter the appropriate PPE (Personal Protection Equipment) needed in just a few seconds using our recommended method. Our system is designed to protect your employees and assure that accurate hazard data is transmitted to workplace container labels. Watch our GHS workplace label training video. Q: How do I identify the appropriate pictogram on your label? A: You can use one of several methods. The preferred method is to blacken out unessential pictograms that are not relevant (see graphics below). You can use a chisel tip marker or other methods. You may also use a checkmark or an "X" on the appropriate pictogram. Or you may draw an outline encircling the appropriate pictograms, being careful not to mark over the red border or icons on the essential pictograms. See our instructions sheet. Q: How difficult is it to train employees on how to use your workplace labeling system? A: Training is stress-free! Our method is very easy to understand. Simply do a demonstration using our workplace label and a GHS labeled chemical container. Also, our GHS workplace label training video can help to reinforce the transfer method. We also recommend having student do practical exercises in the classroom using GHS product container labels, SDSs and our label to assure they understand the correct method of hazard information transfer. Q: How was your label developed and are companies using it? A: We are very proud of the international success we've had with our label. The label was designed and tested over a two year period in the workplace of several Global companies and with consultation from numerous safety, OSHA and risk management consultants. Q: Does your label come in different languages? A: Yes! Our label is sold internationally and can be special ordered in other languages by contacting us. NOTE: Orders for labels in other languages must be a minimum of 10 rolls or greater. Customers requesting special foreign language orders will be required to approval the final draft language before the labels are shipped. Q: Are secondary containers of water required to be labeled with the GHS system? If so, how should I fill out the label? A: Only chemical/hazardous materials that come with a GHS label and/or SDS are required by OSHA to have a secondary container label. But, that said, water in a spray bottle or other work place containers can be labeled as a matter of safe workplace practices. Marking water containers is especially important in chemical work environments where water is used with chemicals that are water reactive. And the practice should include training to alert employees of any hazards. The product ID can say "WATER" and "N/A" for signal word. Unessential pictograms should be marked out with a chisel tip marker to prevent confusion. If desired, put warnings in the hazards and/or precautions section of the label if the water brings danger to the work tasks, such as "reacts with Acid", or "don't spray near live electrical parts". If there are no hazards present, then they can leave the hazard section of the label blank. Q: Does OSHA require us to use the PPE codes at the bottom? Is it just for chemicals that have an HMIS code? A: Use of the PPE code is optional for employers and not required by OSHA on a workplace label. That said, it is a good safety feature to recommend PPE to an employee. Use this chart as guidance on PPE selection. It is not required to use our chart, it is acceptable to simply write SG for glasses, FS for face shield, and G for glove, for example. Another option is to create your own code. Refer to the SDS to determine what the best PPE selection for the chemical being used. Q: How do I keep oils and solvents from smearing the ink I use to fill out your label? A: It's is best to use a black indelible ink when writing on our label, such as a Sharpie® Fine Tip Marker and a wide Black Chisel Tip Marker works well when blackening out any unessential Pictograms. All inks have the potential to breakdown, smear or smudge when exposed to hydrocarbons and/or polar solvents. We recommend that after completing the label; cover it with clear packing tape. The clear tape is see through which keeps the label visible and it will protect the label and your ink from any liquid chemicals that may cause staining and/or smudging.